Our goal today was to see some of the interesting cacti reported from around Aramberri. Just two stops today. S3199 sounded interesting enough, just a few km off the main road from Dr. Arroyo, before La Escondida where we would turn east to Aramberri. Gymnocactus subterraneus and Turbinicarpus pseudopectinatus were listed amongst the cacti found at this stop. We were to be disappointed, seeing just Thelocactus buekii, Echinocactus platyacanthus, Feriocactus pilosus and Mammillaria formosa and M. candida. Of course there were numerous unidentified Opuntia and Cylindropuntia as well, plants that were so common that you’d hardly notice them after a while. Not as common were the huge plants of Dasylirion that need more research later to identify the species. The data we had suggested a 200 m walk up a hill to find our target plants. Common sense told us that these target plants were extremely small and were not expected to be in flower, so chances of finding them were slim. After a while it became clear that we were not going to find them, when the sound of a car crunching the grit on the track alerted us of approaching traffic, in the form of a mini bus. We were by now high on a hill top and watched as the minibus stopped near our cars and a man got out and walked around our vehicles. A bit later, Bart emerged at the car, having chosen to look at the other side of the track. Through my zoom lens I could see him talking with the person from the passing vehicle who then returned to the car. We had all decided that it was time to come down the hill, where we learned that the mini bus had been occupied by Czech cactus tourists. The one person who had spoken with Bart only spoke Czech and a little bit of Spanish, so the conversation had been limited to mutual nodding at the names of plants that we had already seen and had hoped to see. Lots of smiles and friendly sounding words and off they went, back to the main road, to be followed by us after we had gathered the troops, and never to be seen again by us, at least not today. The scenery at S3199 was quite dramatic with camanchaca-like clouds drifting over the distant hills; perhaps another fog related presentation could focus on plants where hill fog provided important regular humidity to support succulent plant life. After the turning at La Escondida we agreed that the first task should be to secure accommodation for the night. SatNav suggested Hotel Esmeralda which we eventually found by parking on the square and sending Ian and Alain on a run around the town. SatNav insisted every time on sending us the wrong way up one way streets. On foot, that tends to create fewer problems. So the hotel was found and rooms were booked, leaving us free to take a look at one of the many locations to the north of the town for Ariocarpus confusus. A strange name? Not really, for a plant that has tubercles somewhere between A. retusus and A. trigonus and a highly variable flower colour, from white to pink to magenta, with yellow also reported but not seen. To get to the location coordinates, we had to cross a small stream. The ford was flooded and so we sent Alain and Sarda on foot through the fast flowing water to establish the depth. Encouraged by the result, Bart was the first to drive our car through, quickly followed by Cliff in the other car – too fast for me to catch it on video. Once at our location (S3200) we quickly found huge numbers of Thelocactus conothelos, as well as many large Echinocactus platyacanthus. 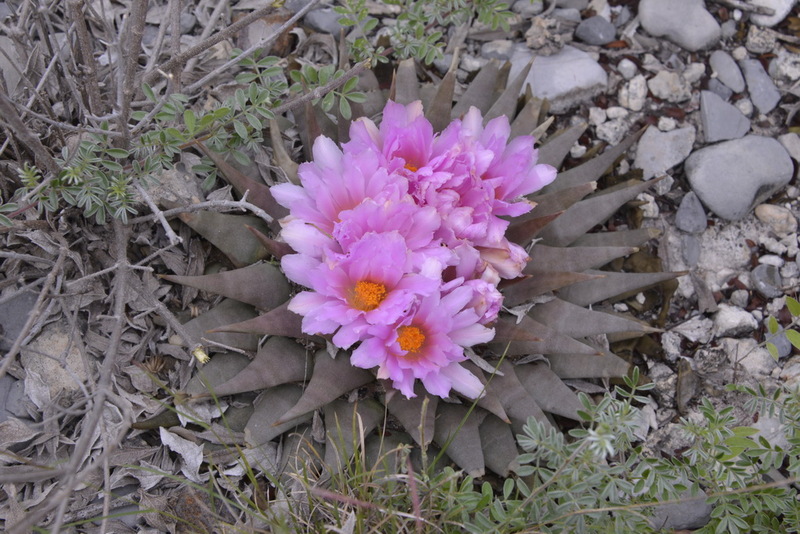 We realised that we were on the northern side of the hill – fine for cacti on the southern hemisphere, but not so good here in Mexico – so climbed to the top and on the crest of the hill soon found our Ariocarpus in large numbers and in flower! A great stop, that also provided the first time that I remember seeing E. platyacanthus in flower. We made sure that we were first to cross the river again, so that we were sure to have our cameras in video mode, ready to catch the other car coming through. They arrived … and stopped. Then Ian got out, rolled up his trouser legs and walked through the water, to join us in our video exercise. Then Cliff followed in the car – all captured on video – a nice change in future presentations from endless pictures of Ariocarpus in flower!